The project thumbnail is based on the active design of the project’s home page. You can customize the thumbnail by editing that design. You can open a project by clicking the thumbnail or project name. In addition, if there are unread discussion topics in a project, you can jump directly to review by clicking the unread topics badge, which looks like this: . The toolbar contains controls that allow you to view and sort the project list in different ways. 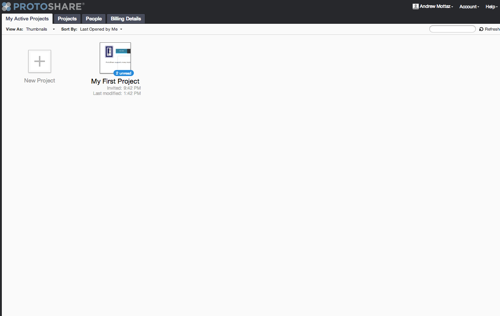 You can filter the list of projects by typing into the search field in the upper right. Hovering over a project thumbnail reveals two small buttons: one ( ) for editing details like the project’s name, and one ( ) for duplicating the project. Continue reading to learn how to manage your projects.